choose an option 20 ft. 10 in. x 20 ft. 10 in. 20 ft. 10 in. x 24 ft. 11 in. 20 ft. 10 in. x 27 ft. 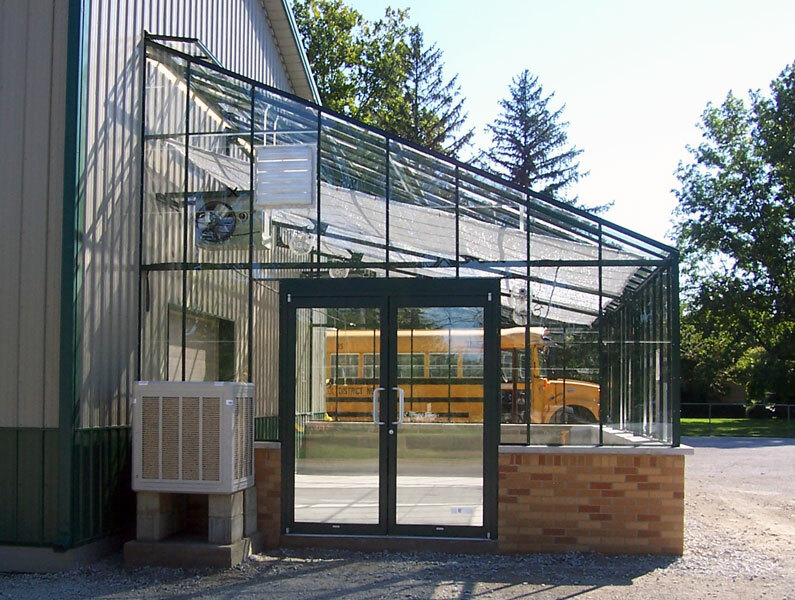 The Collegiate Teaching Greenhouse features a bronze, green or white aluminum frame and panels of 3mm clear tempered glass. This beautiful, long-lasting greenhouse builds easily on your foundation or existing slab. Aluminum extrusions have a baked-on enamel finish to match existing architecture. The result is a teaching greenhouse that will support generations of students. Door (width x height) 34-3/8" x 6' 6-13/16"
Sturdy extruded aluminum frame with attractive Green, Bronze or White baked-on finish. Beautiful, clear 3mm tempered glass from peak to ground (double glass or 6mm polycarbonate available as an option). Automated evaporative cooling system will maintain greenhouse environment to within 5 degrees of wet bulb temperature. Automated heating system will provide up to a 50 degree temperature rise (indoor over outdoor). Horizontal air flow fans for even temperature distribution and optimal air circulation for healthy plant growth. Micro-processor based greenhouse controller manages up to 3 cooling and 2 stages of heating. (1) commercial grade gable end swing door comes standard with ADA approved hardware and closer (double doors shown in picture are available for additional cost). All greenhouse components are pre-cut and drilled for easy bolt together assembly. Installation instructions and assembly DVD included. 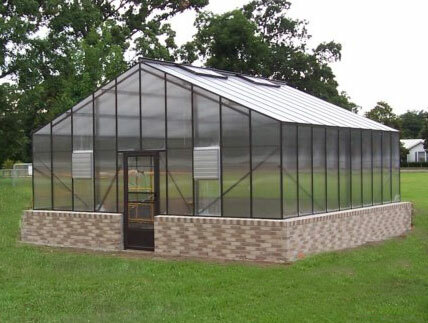 The Collegiate Glass Greenhouse Package can be installed at grade or on a customer provided knee-wall. Please confirm foundation details with Greenhouse Megastore when placing your order. 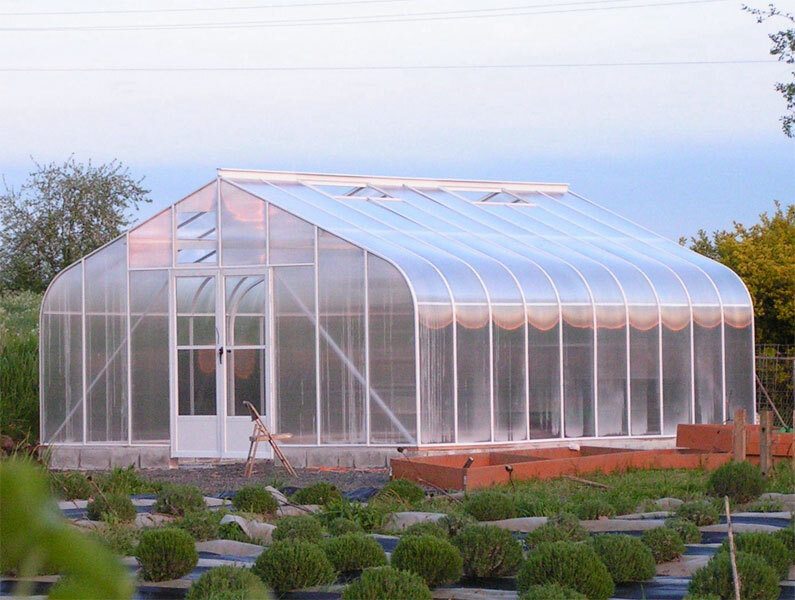 Curved-eave Collegiate Greenhouses are available for a slightly higher price. Please contact a Greenhouse Megastore sales representative at 1-888-281-9337 to confirm pricing. Our Collegiate Greenhouse Package is also available in a lean-to configuration. Please contact a Greenhouse Megastore sales representative at 1-888-281-9337 for pricing and details. 1. Build the greenhouse with your students and boosters who have construction experience or hire a local contractor to erect the structure. Components supplied are pre-cut and drilled. Step-by-step installation instructions and DVD video are included. Greenhouse Megastore provides online and telephone support to answer any questions you may have. 3. A combination of (1) and (2). Greenhouse Megastore can begin the project by setting the column posts and your students, boosters, or contractor can complete the rest of the structure with Greenhouse Megastore supervision. For information on how best to plan your greenhouse assembly and construction prices, call our Sales Representatives toll-free at 1-888-281-9337. A complete line of accessories including heaters, fans, benches, grow lights & irrigation systems have been designed to provide you with a fully functioning, fully automatic Collegiate Teaching Greenhouse. Browse our Greenhouse Megastore or contact a Greenhouse Megastore Sales Representative Toll-Free at 1-888-281-9337 for pricing and information. *Normal shipping time is 4-6 weeks after receipt of order. Please allow additional time for transit from factory. 50% of basic greenhouse price may be charged upon receipt of order. The balance will be charged when shipment is made.